I was recently cleaning out my gun room and came across some old magazines. 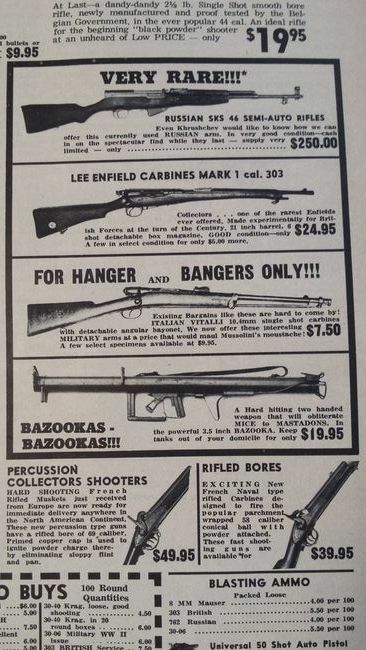 The attached ad was in a 1962 issue of Shooting Times. I laughed out loud when I read the caption on the bazookas! You might have to zoom it a little to read it. Cool you can't take any chances with mice. That SKS price is amusing. Let's see.....Bazooka for $19.95 or an SKS for $250? I think I'll take a dozen bazookas please. I wish I’d known about this in ’62 - as I recall, we were having a heck of a Mastodon problem on our place back then. A couple of bazookas would’ve thinned the critters out pretty good!